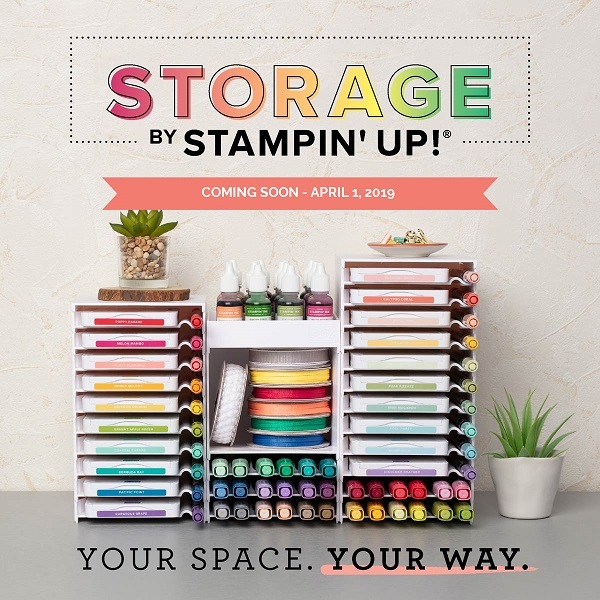 Hi, when I first received the Occasions catalogue there were stamp sets which jumped out at me and I knew, without any hesitation, I would be getting them. Then there were a few sets which were slow burners…and the Charming Cafe set was one of them. I admired it, for sure! The examples in the catalogue are gorgeous but it didn’t ‘speak to me’. I decided to pick out a few things which weren’t my usual type and this is one of them. I am SO glad I ordered it. It is a beautiful stamp and die set. The following card is actually my first attempt at creating with this stamp set. It won’t be my last! Whilst it isn’t my favourite card ever I learned a lot while making it so I really wanted to share it with you all. Another reason for sharing is to remind you that you might not love every card but there’s something you can take away from it (and there’s nothing to say that the right recipient won’t adore it!). I started with a sheet of 30.5cm x 30.5cm whisper white cardstock. I cut a strip from the card stock which was 13.9cm tall. I used a score board to make score lines at approximately 10.2cm and again at 20.4cm. 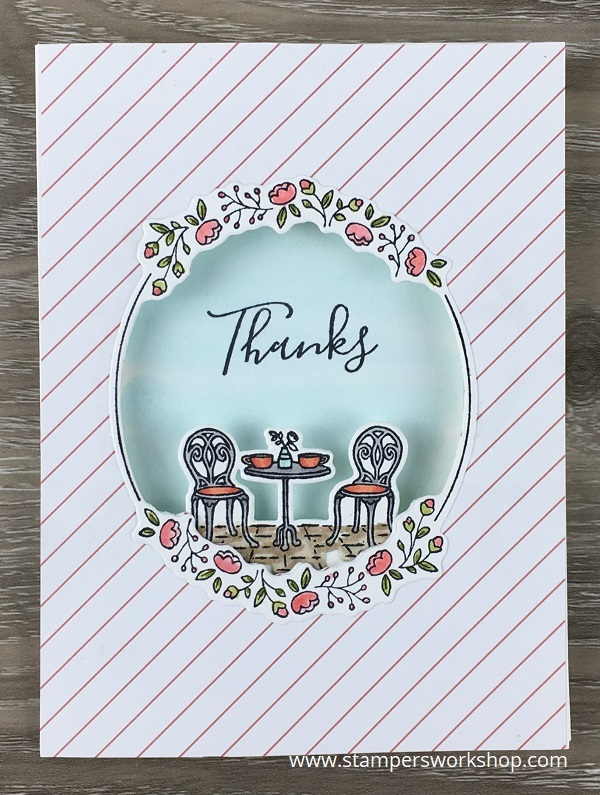 On the front cover, I adhered a beautiful card from the Sweet Soiree Memories & More Card Pack (which you can earn for free with a qualifying order during Sale-A-Bration). Unfortunately, I dropped the card as I was lining it up so you can see, if you look hard enough, that the base card can be seen at the top left and bottom right corners. (I’ll pretend I meant to do that!) The card I used had a picture of a heart in the centre but I knew the die would cut it all out. I used one of the dies to cut out the top panel. Just remember to unfold the card before you run it through on your Big Shot as it will cut through all the layers and you don’t want that! On a separate piece of paper, I stamped the floral oval which I coloured and cut out with another die. I adhered this to the front of the card. It covered the tiny bit of the heart which I had missed with the die! So far so good! Next, I moved to the panel which you would see after you opened the card. Just make sure you are working on the correct panel. I decided not to stamp directly on this panel as I thought I’d mess it up for sure! Fortunately, there is a die in the set which cuts out only the table and chairs so this isn’t a problem. I stamped it separately, coloured it, die cut it out and I was ready for the next step – to cut out the centre of the panel. I took my die (make sure you have it around the right way) and positioned it where I thought it would go. I closed the card and then made any necessary adjustments. A piece of post-it note held it in place. Remember again to unfold the card before you send it through the Big Shot. Adhere the die cute table and chairs to your card. Phew! Stage two complete…aside from the little bit of black ink…uh oh! I folded the card closed again and selected a sentiment stamp. I layered it where I wanted it to go. Opening up the card, I stamped the image. This panel looked a little too stark white. A nice wash of Tempting Turquoise ink added the much-needed hint of colour. Voila! The card is complete! I hope I haven’t made it sound like the card was a lot of work to assemble as it really was straightforward. 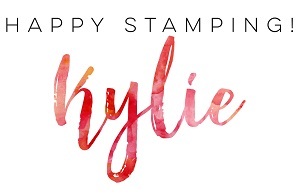 I’m thrilled with the basic concept and I love the Charming Cafe stamp and die set (available both separately and as a bundle). I really just wish I had gone with some different colour choices. Oh, and making sure my hands/nails were free from ink would have been handy too. haha I think any recipient would love this unique tri-fold card.